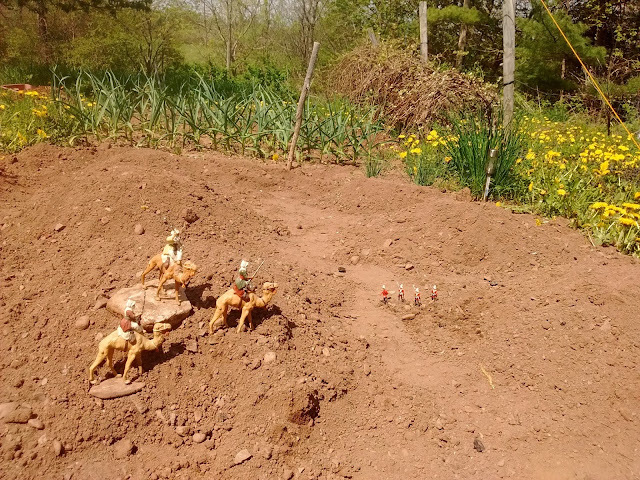 I wish this post was about playing in the Garden with Toy Soldiers but really its just to fill a void. Spring is always short in this corner of the continent but this year we seem to have gone from Winter straight to Summer with just room for Huzzah in between. So I've been mowing and sowing with some tilling and other associated yard and garden chores and precious little time and energy left over for wargames. Gotta be a rainy day soon! Desert Warriors spy on a Red coat patrol investigating a report of a massive Dandelion encroachment. Meanwhile, I have had moments to pick up reading Camps, Quarters and Casual Places, a series of essays by 1870's war correspondent Archibald Forbes (free eBook from Amazon but well worth $20 or more) . Most of the essays are interesting rather than directly useful to the wargamer, Christmas in an English Dragoon barrack, behind the lines during the Franco Prussian War, fishing in Scotland, a walk through Lucknow 20 years after, Bismarck, etc but one struck me today as worth the rest at this particular moment, an essay comparing warfare in the musket age vs the rifle age and a forecast of what it would be like as armies adopted magazine rifles, MGs and rapid fire artillery. Suffice it to say that in the late 1870's he forecasts the tactics of 2nd Boer War and early WW1 very closely as well as predicting the strategic stalemate of the trench warfare 40 years in advance. But then he was a civilian, an observer and historian of wars and armies, not a soldier. More than that, his much deeper and personal study of experience of current wars vs earlier ones confirm my much more casual conclusion that battles during the breech loading rifle age when weapons were more deadly, were less decisive, more drawn out and with fewer casualties (ironically given the amount of lead flying about and occasional high local casualties when someone tried to ignore current realities). He backs this up with comparisons of similar events from sieges and battles as well as statistics but my point is I've been floundering over wargaming the period because of the same things that he describes. The uniforms may be those of HG Wells and it may sound ideal but to be realistic a tactical game of the era will often include long stretches where lines of infantry lie down or entrench and shoot at each other, periodically interrupted as attempts to rush the defenders are shot apart. Hence the attraction of small wars, especially against "savage" enemies or battles as soldiers and correspondents told them or of listening to Lawford and Young and using rules for an earlier era regardless of how the soldiers are dressed. Finally, a few hours to catch my breath. I put some 25mm Medievals into a pan of water to soak prior to rebasing to 60mm standard bases and turned my attention to why the 6" squares were causing me grief over both rules and organization. Part of it was fairly obvious, it changed the illusion. I just wasn't sure how, why or what to do about it. The thought came to me that the inner debate felt similar to an earlier one from the turn of the century about Volley & Bayonet (or Morschauser) 1 base is a unit vs a unit being a group of single figures vs a unit being a group of smaller stands or elements each with a few figures so I dug out some old photos to remind me of past gaming systems and what I liked about each and that helped. I also pulled out my 3" grid portable tabletop and tried a few things. a) When using 1 large base as a unit or a small grid with a few figures, the result is so abstract that the mind accepts it as a marker that represents the unit, much like a 2d game counter. 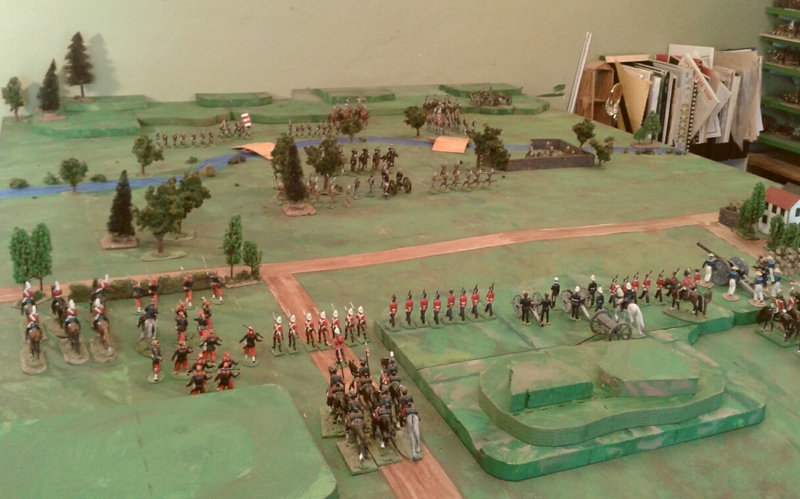 b) When using a larger number of figures the wargame unit begins to resemble the real thing even though much reduced. This leads the gamer to want to play with the figures to form lines or columns etc and to want more tactical details. The visible difference in distance of adjacent units which can anywhere from almost touching to being 10 or 11 inches apart with no difference in how the rules treat them begins to bother a person like myself who has decades of expectations tucked into his head. c) When using a grid with more squares or non-gridded rules with short unit frontages, the game invokes a larger scene and encourages one to think in sweeping panoramas as while a game with a few larger squares or larger units, is like zooming in and leads to an expectation of being able to see more detail of what is happening and why. After some hard thinking and a bit of experimentation, I have decided that the easiest way to get what I want out of the late 19thC battle wargames is to either carry on with the original plan of subdividing my 6" squares into 4 quadrants which may either be used simply as a 3" grid or as a way of subdividing squares to allow things like close or long range combat between adjacent areas, or to ignore the grid and stick the 40mm figures onto large square bases with each being a unit. The subdivision has long been intended, is very little work and can be ignored later with no work at all. Rebasing is lots of work and if it fails is even more work to undo. Subdivided or smaller squares it is. Next came the question of 1 set of rules or many. A very little experimentation and a review of December's Gettysburg exploration easily led to the conclusion that small squares with 2 stand 1/72nd or 4 figure 40mm units would easily allow the ACW game to proceed at around 200 yards per square with regiments as units for fighting division and corps sized battles while the same grid could be used at 100 yards per inch and 4 single figure companies as units for a lower level action with the large figures. How to fit boats on the grid or the train on the grid is a question for another day but if worst comes to worst and my imagination fails, the grid can be ignored or covered and a set of skirmish rules used with the same 40mm single figures. Gathering of Hosts: Modified Morschauser 25mm medieval figures with each 60mm base being a unit, grid optional. Rough Wooing: Modified Morschauser 40mm 16thC figures each 60mm base is a unit. NQSYW: Charge! rules, 18thC no grid, 40 - 60 individual figure units. 1812: Hearts of Tin. 40mm figures on bases 3-5 elements as a battalion. Atlantica& WWI: The Square Brigadier with 4x40 mm figures as a unit on a grid. It'll be interesting to check back in 3 years and see if this holds up! So much for the long term. What's up for the next few months? In no particular order. 1. Gathering of Hosts Blog: Having settled on organization and basing and with rules well in hand I want to get 3 armies refurbished and ready to rumble, bases and all including some more new figures. 2. Atlantica/WW1 I took a game that was working for me and by changing the look somehow also seem to have harmed the substance. I need to figure this out, (blog posts and test games) then choose which way to go for each of the late 19thC, WW1 & Colonial stuff. In the meantime I intend to keep painting figures. 3. Sculpting and casting. I NEED to get back on that horse, get some better putty and make some masters and some molds. A 19th C Faraway (Canadian style) infantry figure is 1st priority. 4. ACW. I need a decision on grid/no grid and regiment size then I want to fix up some command stands, fix the artillery a bit, mend some fences and build more, then, by July, play another game. 5. AWI. I want to bring these back to Huzzah next year so I have to decide what I am doing. 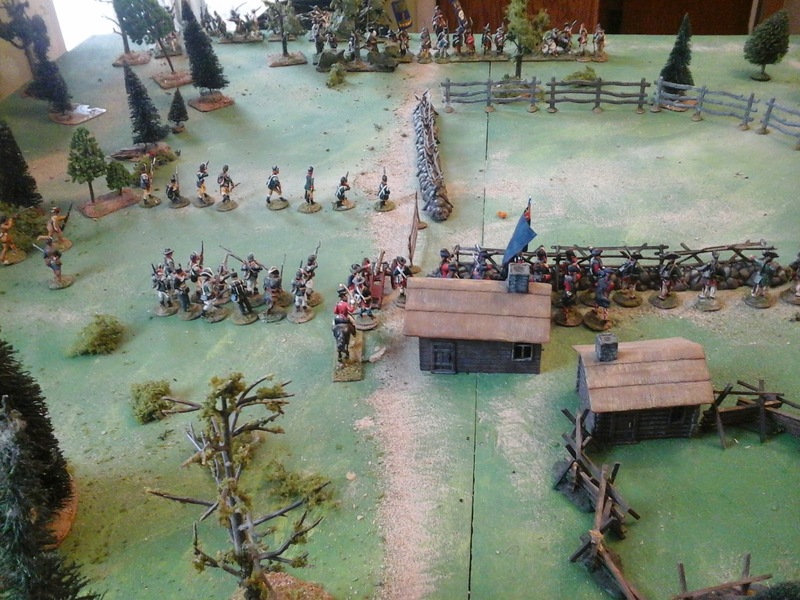 I am tempted to reprise in 40mm my 2001 game based on Montgomery's assault on Quebec but I need to consider if the game will be interesting enough for the work put in and Quebec is long behind me. A Trois Rivieres "what if it hadn't gone so wrong" scenario has potential as I already have many of the troops I would need but again it is Quebec. The idea of setting a game in Nova Scotia or Maine attracts me. One option would be to take the example of the rebel siege of Fort Cumberland and expand it to do the siege and reiief of the fictional Fort MacDuff. Nova Scotia rebels, Acadians, Malaseet and New Englanders vs Loyalists and British and maybe some Brunswickers as long as we're tweaking history. Needs thought then action in terms of scenario, making terrain and making figures. I've already starting enhancing MacDuff. Adding more chrome where it helps, removing the stuff that slows without adding. Getting out has been good for me and for MacDuff. 6. Rough Wooing. I have a handful of 16thC figures I want to paint, maybe for a game in the fall or just to get them off the lead and plastic mountain. That should keep me busy for a few months especially when the unplanned is added. 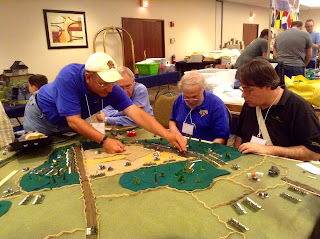 Well, Huzzah,the Maine Historical Wargamers Association annual convention, has come and gone again and I am now back home after a stop to visit family. 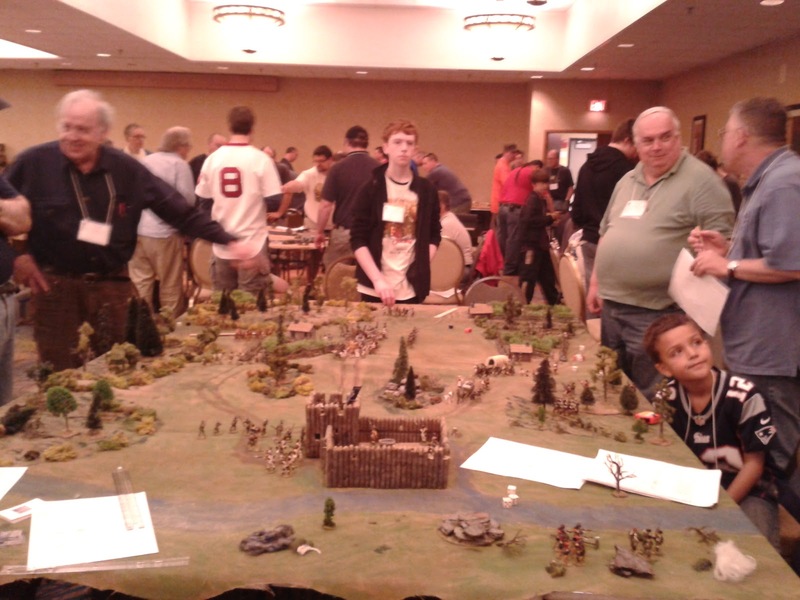 I was too busy to have done a proper survey but there was a wide variety of styles of games from the latest fads in historical miniature wargaming to old classics to innovative new games, historical, scifi, fantasy, board games and more. Here's a quick summary of my weekend. One of the highlights for me this year was the appearance of a contingent of HAWKS from Maryland. (see Chris's report. - no idea how he did that camera trick where the hair on top of my head disappears.) The HAWKS are an active and creative group who put a lot into the hobby. I have known and gamed with them at conventions and by email since late last century and around 15 years ago they handed me a shirt and kindly adopted me as sort of a foreign mascot. For the last 4 years I have been unable to attend any of the big HMGS cons so this was a welcome chance to reconnect with friends. Rob's 6mm fantasy armies on a printed game mat. Much more attractive than the handpainted one of the Chateaugay battlefield that I did in 1998 for my first appearance as a gamemaster at a US con. This one seems very durable but then my old one was refreshed and saw service at Huzzah last year so I guess it is durable too. Friday afternoon was set aside for Rob Dean and myself to test out the basic rules for fantasy mass combat that we are adapting from Morscshauser's shock period rules. 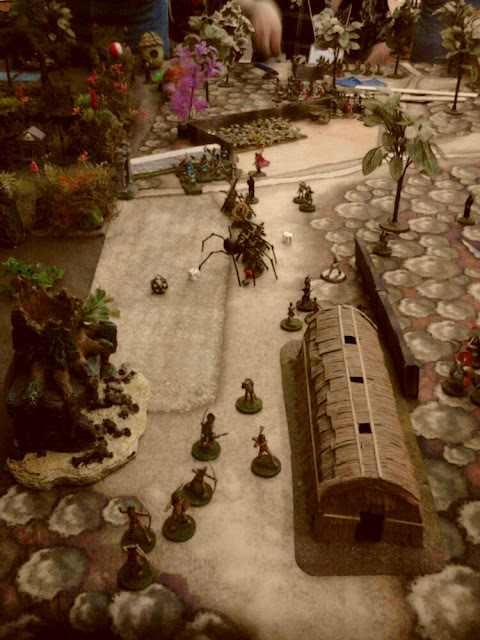 Rob's goal is a game using classic fantasy miniatures from the 1970's but for the test he brought along his much more portable case of 6mm HOTT fantasy figures and terrain and we lucked into an open table. We added a movement rule for flyers and assigned standard movement, armour and combat ratings for various non human units as seemed appropriate. We had no magic rules yet but Morschauser urged some form of objective beyond killing the enemy so we set a magician on the hill conjuring a spell to reduce the bad guys (elves and such) castle to rubble unless they (Rob and son Norman) could reduce the good guys (orcs and wolves and such) to below 50% before they suffered the same. Despite the small stature of the figures the action ranged across the whole table in a satisfying manner with my horse archers ending up behind the enemy's center. More on this soon on my Gathering of Hosts blog but the explosion that rocked the castle was very satisfying. 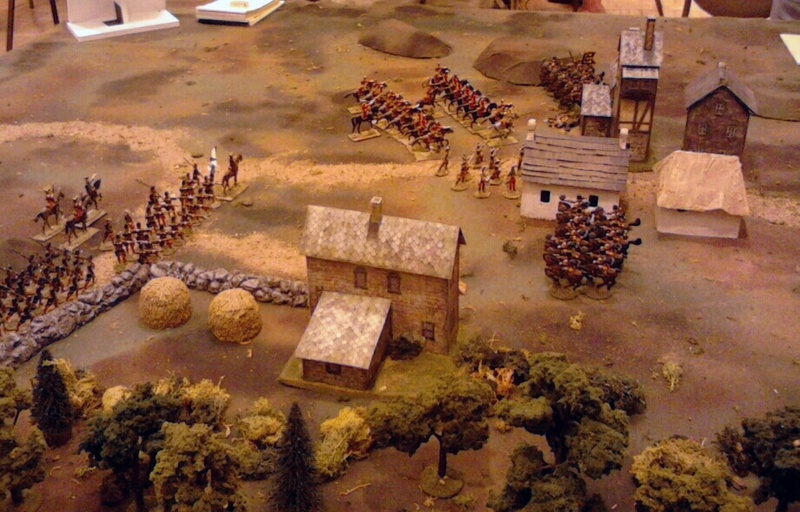 Friday night was our 1st Not Quite The Seven Years War (NQSYW) game of the weekend. 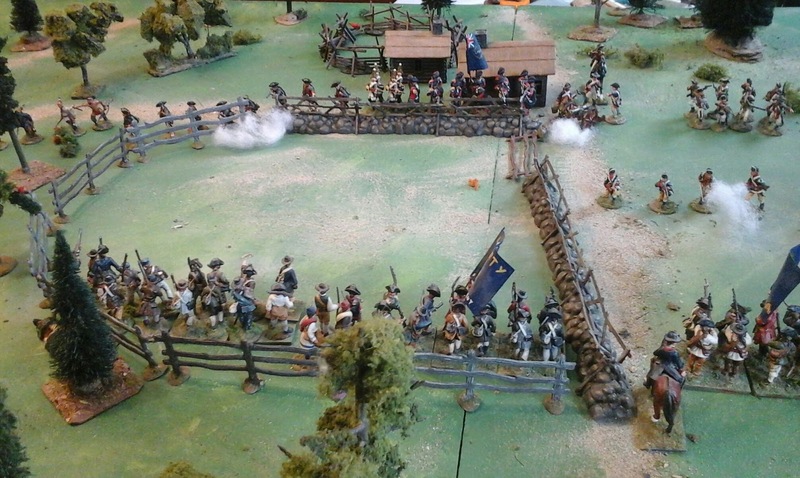 CS Grant's Sawmill Village using Charge! and Prince August home cast 40mm home cast semiflat figures. Friday night was the first of two Not Quite The Seven Years War (NQSYW) games that Rob and I hosted. We were a bit short on players but one of the good things about a group like the HAWKs is that there is almost always someone to step in to make up numbers sufficiently for the game to go on for those who have signed up. HAWK Bill Acheson's Empire of the Petal Throne by Gaslight. Saturday morning it was my turn to help out as a NonPlayer Character running a native tribe hostile to strangers in Bill Acheson's Empire of the Petal Throne game. I don't do a lot of this sort of gaming but it is fun to unwind and indulge every now and then, esp when it provides a chance to enjoy Bill's marvellous creativity and ingenuity when putting a game together. Not Quite Fontenoy. Rob explaining Charge! to a full slate of players. 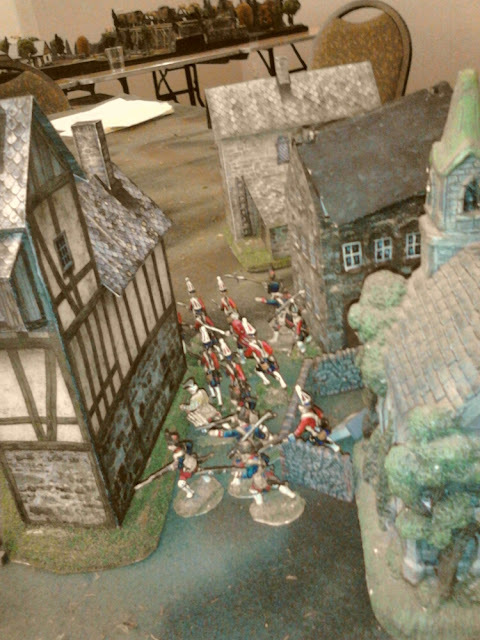 Saturday afternoon Rob & I ran another NQSYW game with the 40mm semiflats, Scenario 1 from Scenarios for Wargames or the rather-reminiscent-of-Fontenoy scenario. I won't clutter this post with dimly lit, fuzzy, cell phone snaps but I do have 1 or 2 more that will appear in a longer account of the battle on the NQSYW blog ere long. Suffice it to say that the game was a squeaker with a long lasting series of cavalry charges and counter charges and much shooting and storming of houses. As the light faded though, with both armies well battered, the Northern Alliance was still clinging to 2 of the objectives. The combined Rosmark Grenadier battalion ended the day bloodied but still in undisputed possession of the right hand town. Saturday night I had been scheduled to play in a new Firefly board game but was too tired and hungry and backed out in favour of dinner. 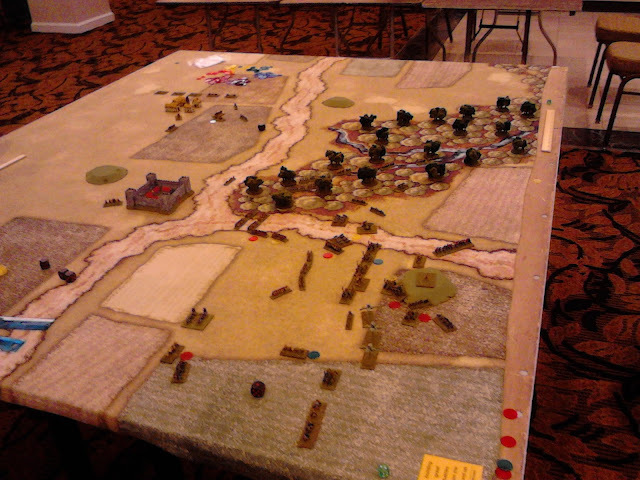 Afterwards I filled in an empty chair in Eric Schlegel's 10mm ACW using the ACW version of Look Sarge No Charts. I've seen various No Charts games being run over the years but never played so I was able to satisfy my curiosity as well as being useful and having some fun. I didn't take a picture so hopefully Chris will forgive me from borrowing one from his blog. Sunday was a relaxed day. 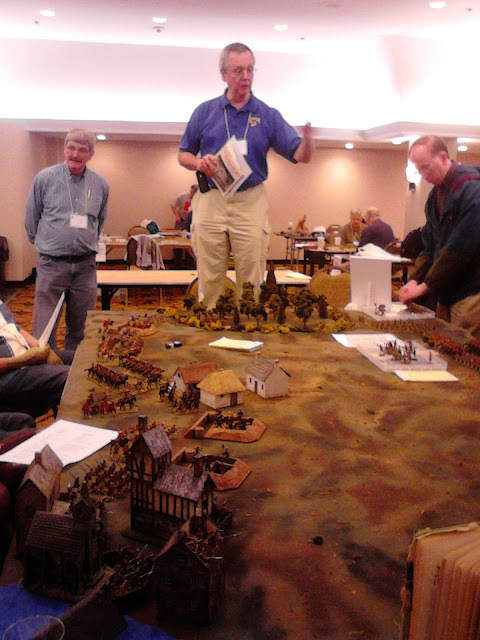 I wasn't booked for anything so I wandered around the tables, dealers and flea market but concentrated on watching a Light Bobs game to see how it worked and hovering over Gary, my travelling companion, who was in his element playing in a 28mm Black Powder Waterloo, and offering helpful comments like "Haven't you broken into Hugomont yet?" At last it was all over and time to pack up and hit the road, already considering next year's game. Leading contender is a 40mm reprise of Montgomery's New Year's Eve assault on Quebec which I ran in 54mm at Cold Wars in 2001, but its early days yet. Thank you to the organizers for all the hard work that goes into hosting an excellent convention like this and thank you to all the great gamers who played the games Rob & I put on. This is the 5th or 6th time that I have worked on a set of "universal" horse and musket era wargame rules, all sub-periods and all sizes of game from skirmish to small battle. The topic of a universal rules structure or series of rules using the same mechanisms and scale rather than having a unique approach for each game has come up several times on this blog and can be traced back as far as my 1989 article in Wargames Illustrated 23. This current attempt is running into the same roadblock of it being more work than its worth. According to the most common version of the story of Robert the Bruce and the spider, I should succeed on my 7th try but, on the other hand, there is Einstein's well known quip that the definition of insanity is doing the same thing over and over while expecting a different outcome. While taking a break from the frustrating task of trying to distil a complex set of situations into a simple yet clear and reasonably complete set or series of wargame rules, I have been considering my current and projected collections of toy soldiers and slowing coming back to the opinion that there might be a distinct advantage to having each collection of soldiers organized to provide as different a gaming experience as possible. Its already on record that in 1859 (I need to check that date) the Faraway Trading Company lost its Colonial government status in Northern Atlantica. The old Director General's Bodyguard which had kept the peace in Kapele, when not fighting Faraway's wars, had to be disbanded or taken over. HM decided on the latter and the unit was taken on as a sort of colonial Gendarmerie under the name of The Kapelle Mounted Rifles and given new uniforms. The Kapelle Mounted Rifles in their new uniforms c1880. Another unit refurbished and ready for the next war. The Director General's Bodyguard was one of the first units I did for the 40mm version of Faraway's armies. Since the original 54mm version of Faraway and Oberhilse was set in the 1870's I started doing them in the uniform of the Canadian Governor General's Bodyguard at that time. I had barely started when I decided to back date the campaign to c1840, muskets and coatees or shell jackets rather than rifles and tunics. I decided to leave them in butcher boots and helmet but shortened the tunic to a shell jacket. Not quite an appropriate combination but with all that dark blue it was hardly noticeable and they became a favourite unit. The presence of blue cavalry in the Red army and red cavalry in the Blue army was awkward at best when doing battle reports and eventually I retired the rec coated 1812 New York Dragoons that Oberhilse was using and I issued red shell jackets to the DGBG but never liked the effect. I didn't like the white trouser stripes with the red jacket and the tight blue pants didn't look right and somehow seemed to accentuate the poor job I had done on the helmet plumes. The regiment fell out of favour but was still used when necessary. Since I'm back to the 70s and 80s I decided to trim the plumes, put the tunics back and fix the colours. Now I like them again! Twenty years ago I would not have thought of painting figures that were not shaded, highlighted, and as detailed, historically accurate, and least toy like, as possible. I certainly went to great lengths to avoid having horses all marching or worse, galloping, in step. Well, I am older, wiser and less mature now but really in a way, this toyish look is accuracy or rather honesty of a different sort. It is what they are in this context. Oberhilse Hussars of the Republic, often incorrectly referred to as Guard Hussars. I didn't plan this in advance though. 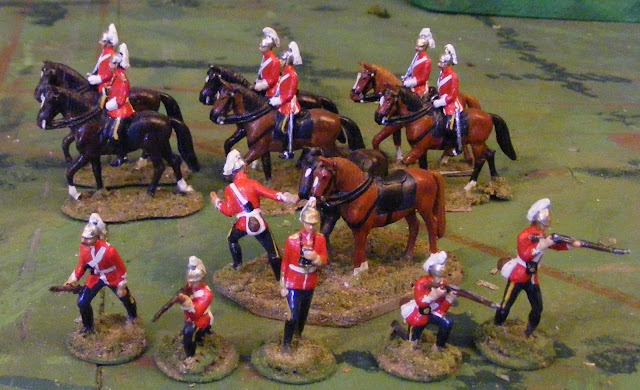 It was while I was sorting through horse parts from the Zinnbrigade 1815 English (sic) Dragoon Horse molds and doing the usual mash up trying to get 6 different horse poses from the 2 rears with 2 tail positions each and 4 fronts, that it struck me that these were toy soldiers. German flats came with such varied and animated horses and many plastic soldier sets included at least 2 or 3 variations in horse poses, but what about the Britain's horsemen used in Little Wars? I had already undercoated the officer's horse in burnt umber when I remembered the different colour thing. Rather than lay on enough light grey and white paint to cover the dark brown I painted him Black. Britain's also seemed to have painted most trooper horses as Bays but without the black points on leg and nose or perhaps they were chestnuts with very,very dark tails that just look black. After hemming and hawing I followed suit and painted them mid-brown with black main and tail. At least I'm having fun and don't they look dashing? and sooooo well disciplined! I bet the horses would make the charge even without riders. Bugler! Sound Charge! Well, the Winter campaigning season, such as it was, is over. Spring has been skipped and we are now in full summer mode. Wow, what a mess the yard is! I have been trying to finish up the 2 new lancers and the 5 new horses for the Oberhilse Republican Guard but they have been resisting so there are still some belts and bits of harness and details to finish and touch up. Apart from domestic distractions though I've also hmmm...used up .. a lot of time reviewing past posts as I prepare a summary of my plans and as I try to confirm that I'm on the right track ruleswise. Now even I am not self absorbed, diligent or crazy enough to read every one of the more than 1,000 posts (really? didn't seem that many at the time) , but I did at least scan enough to interfere with painting, playing and rule writing over the last week. Archive shot of a game from April. This is the look that will continue. Three things struck me as worth heeding. The first is that there is a fair amount of repetition as various thoughts and issues pop up and are considered . The second is that despite superficial changes some things have remained fairly constant for the last 10 years. Lastly, despite some change in detail, what I want and what I am planning have remained surprisingly constant. The full plan is still coming but with great relief I have found a wording and format that will allow me to continue to use one set of rules for various sub-periods of horse and musket games in various scales with or without the grid. That is to say the same mechanisms but with different restrictions for units on the grid and off the grid. The plan is to take another shot at having 2 parallel versions rather than trying dealing with awkward phrasing or alternate rules side by side to deal with things like "adjacent". For the foreseeable future the 40mm Atlantica games will stay on grid because I'm lazy!. At the moment the gridded version will keep the title Square Brigadier and has the mechanisms, all tried and proven, that will remain for both as well as some generic stats. I still need to add more detail on units and weapons and special rules for various wars and campaigns but it is available at right. As soon as I can get those pesky lancers dressed and sober I'll play a game then Atlatica will go on the shelf for a bit until I get some sculpting and painting of her Majesty's troops done. But that will have to wait until after Huzzah. In the meantime there are preparations for the Huzzah Charge! games and there is the Morschauser based Medieval/Fantasy exploration. A Distraction. A shot borrowed from Gathering of Hosts blog.